Butterfly, Marine Mollusk, and Pear, from Model Book of Calligraphy (text in Latin), Vienna, about 1591-96; artist, Joris Hoefnagel and scribe, Georg Bocskay. The written word was an art form in the premodern world. 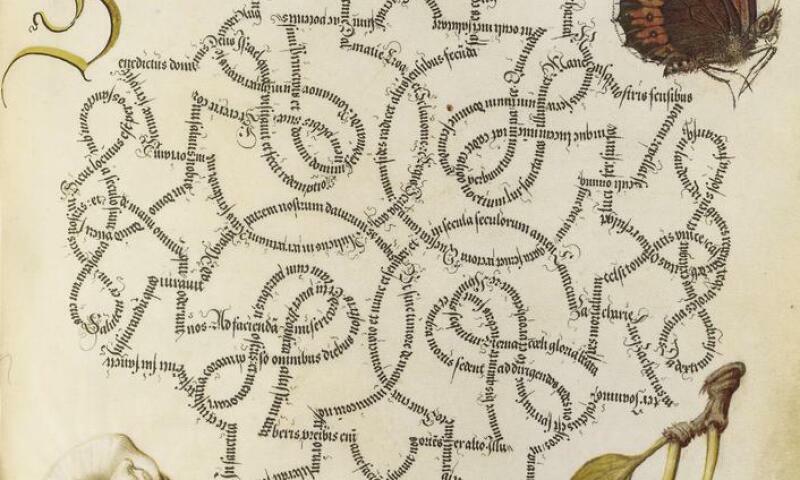 Calligraphers filled the pages of manuscripts with scrolling vines and delicate pen flourishes, and illuminators depicted captivating narratives within large letterforms. These decorative embellishments reveal the monetary, cultural, and spiritual value placed on handmade books at the time. The alphabetic adornments in this exhibition enliven the pages of a range of manuscripts—including sacred scripture, romance literature, and history—produced from England to Central Europe and beyond for nearly one thousand years.